A London pub visit during the 1998 World Cup turned the former Boston College football linebacker into an avid admirer of soccer. Two decades later, 50-year-old Peter Trevisani became the majority owner and CEO of New Mexico United, one of seven new clubs in the USL for the 2019 season. SOCCER AMERICA: You didn’t get into soccer while growing up in Boston? PETER TREVISANI: You played football in the fall and baseball in the spring and summer. As far as soccer goes, I was in the camp of the people who thought soccer would be boring because you get 1-0 scores. PETER TREVISANI: I worked for Lehman Brothers in London in 1996-99. In 1998, this World Cup thing is going on. This could be interesting, I thought. I decided I’m going to the pub next to my apartment, my flat, and watch a game. This is a mismatched-furniture, typical local London pub, the kind that unfortunately are really rare in London now. It’s usually like four guys in there. I arrive early, but it was packed. Watching a couple of TVs in the corner, everyone is passing the beers back. PETER TREVISANI: England vs. Argentina. Even though I knew nothing about the game – I felt a part of it. Seeing it with everyone, feeling how the energy in the room was shifting with the momentum. The goal is just the end game. All that tension that goes into it that gets released creates the emotion and the attachment. I started to get into the emotion. I respected it. I got it. I watched Premier League games and really enjoyed it. When I came back the United States, I had an understanding of the game, whether it was when watching MLS, World Cups, kids’ games. PETER TREVISANI: It doesn’t at all. What I saw there in that pub and what I’ve really come to appreciate about soccer is that it has the amazing power to unify even the most diversified or fragmented place. Soccer, for that 90 minutes, people come together from all walks of life. And not every sport can do that. SA: How did you end up in New Mexico? PETER TREVISANI: I did the football, I went to Columbia and got an MBA. I thought Wall Street was going to be the thing. I thought that was going to be the professional sports of work. And it is. But I got to a point where I decided, this is not for me. I moved to Santa Fe with my wife and ended up taking a job at a tiny boutique finance firm. Which was great. I could do what I like – it wouldn’t be like Lehman Brothers with the sure thing -- but we’ll go quality of life. My wife worked there, too. We built out a really large business and as partners we were able to do some different things. I got to about age 47 and I’m like, it’s time for a change. I quit my job. Time to find something new while I still have the energy. Peter Trevisani hired as head coach and technical director 34-year-old Troy Lesesne (right), who most recently served as assistant coach of the USL’s Charlotte Independence, after being assistant coach of the Vancouver Whitecaps FC and nine years as an assistant coach at the College of Charleston. "It’s his first head coaching job," says Trevisani. "But his passion is without question. His vision for building a club, not just a team, but a whole club, really met mine." SA: So you decided to start a pro soccer team? PETER TREVISANI: Not right away. I sat in a coffee shop for about six months. Nothing came to me. What I did do, is on a piece paper write five things I love besides family. I allowed myself to be honest with myself. SA: And that led to New Mexico United? PETER TREVISANI: I didn’t write down soccer team. I didn’t write down owner. But what I felt was that a soccer team could be an agent of change for the state of New Mexico, where we have raised our family. New Mexico is a really poor state. People talk about how we come in last place in a lot of metrics. The quantitative metrics. It’s true. But New Mexico on qualitative metrics leads in certain ways: community, family, where the head meets the heart. I really believed that if we were to do a soccer team here, it could provide positive outcomes for supporters, for the people who work here, for our players. Everyone on the original ownership group has either been born and raised in New Mexico, or has raised their family here. And that was really important. All are local or have really strong ties to the state and are really interested in seeing the state progress. And I think that is critical because we’re doing more than just playing soccer. We’re trying to be this agent of change. SA: Pro soccer is also a business. What makes you bullish on New Mexico United and the USL? PETER TREVISANI: There are a lot of macro-economic tailwinds right now in the United States for soccer. It continues to grow in popularity as the millenniums push forward. A lot of them were soccer players. It’s a sport I think that relates to the stereotypical characteristics of millenniums. I think there’s a really good relationship there. I also think the soccer leagues in the United States are still developing. MLS has taken big steps forward but is still finding its footing. And the other divisions have shaken out. I think the USL from a league point of view has become much stronger when you look at the new ownership. The fact that it’s people with a lot of experience and that they’re putting these teams in communities that are really going to support them. I think we see the tremendous macro-tailwind there in the evaluations of the franchises. What I also love about the USL and about the soccer pyramid in the United States is still not understood widely in this country: This is not minor league soccer. This is pro soccer. We’re trying to win cups. There’s no situation in Triple AAA baseball where a minor league team gets to play the New York Yankees in the World Series. It can’t happen. But in soccer, through the Open Cup, New Mexico United can face off against LAFC for a chance to go to the Concacaf Champions League. And even if that would be a Disney movie – which it might be – it’s a goal. And it’s an aspiration. Cincinnati losing in the  semifinal shows it’s not out of the realm of possibility. Every single Open Cup, a USL team beats an MLS team. In many cases multiple times. Peter Trevisani was an early investor, along with Game of Thornes writer George R.R. Martin, in Santa Fe’s The Meow Wolf Art Complex, an interactive, immersive art gallery collaborative built in a vacant bowling alley. “That was part of checking my fourth box,” said Trevisani, who serves as strategic advisor. 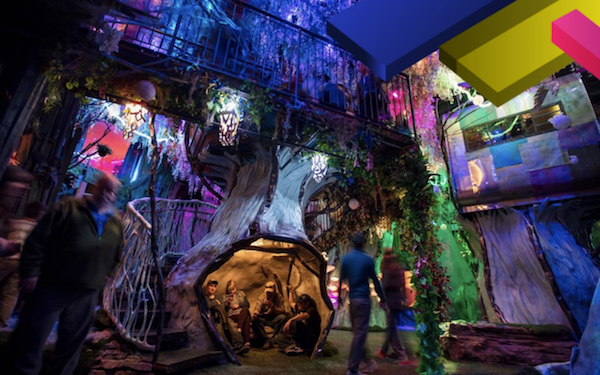 Meow Wolf attracted 500,000 paid visitors last year. SA: What are the big challenges in creating a financially viable USL club? PETER TREVISANI: We’re competing not just with other pro sports, you’re competing with Netflix, you’re competing with other entertainment options, we’re living in a more fragmented world. We’re living in a world where I think all pro teams are trying figure out ways bring people to the stadium. But I think soccer has a huge advantage because the game is 90 minutes, with a 15-minute halftime. PETER TREVISANI: I love the fact that people can come to a soccer game at 7 o’clock and by 8:45 they’re back in their cars, or on the bus or train, or walking back to their apartments with their families. That’s amazing. And a real advantage. We don’t have to worry about shooting T-shirts into the audience or getting people on the field between innings to try and keep people entertained. The players on the field are providing the entertainment. What happens on the field provides enough entertainment. And the audience, the supporters, are also a huge part of the experience. When I was talking about my list, when I talked about immersive theater, that place where people don’t just sit and watch, they actually interact with the performers. I think soccer’s the closest we have to that -- where supporters and players and the game are part of the experience. The fans are expected to play a role in the overall experience of a game. If you go to a soccer game, you’re going to sing, you’re going to chant … There’s going to be a march to the stadium. These are amazing concepts that still very few have had exposure to. And certainly not in New Mexico. SA: And you’re confident that the New Mexico market, which has no major league pro teams in any sport, will support pro soccer? PETER TREVISANI: I think it’s a great market. Its baseball team, the Isotopes, is one of the top Triple AAA draws in the country. The University of New Mexico basketball Lobos sold 9,000 season tickets. There’s clearly an appetite for live sporting events. What’s happened in New Mexico, generally speaking, is many of the pro teams that have come in haven’t had the financial resources to show what pro sports should look like, and have struggled. Pro sports takes a lot of capital. It’s a huge commitment. And for something to succeed in New Mexico, we need the whole state to buy in. To feel like this is their team. That's why we’re New Mexico United, not Albuquerque United. We’re trying to get the whole state behind our team and believe in it. SA: Lots of hopeful owners have come and gone over the decades in American pro soccer. Why can New Mexico United succeed? PETER TREVISANI: There’s a couple ways I think about it. Obviously, there’s a group of people who do it because they have a passion, they love soccer. I don’t think they really think through the economics when they jump in, and they generally tend to struggle because they under-appreciate just how complicated it is to really run a full-fledged operation around professional soccer. There are other people who buy soccer teams who often don’t necessarily care about the economics of a soccer team because they’re much more interested in activating real estate with the stadium, or they're interested in something else, using soccer as a tool or mechanism to promote it. And I understand that. I’m not judging. It’s just a different way about it. In our case, our focus is in the soccer team and economically you clearly need a tremendous amount of capital in the early days, because you’re running the team for a year before you even have a team. And you need a few seasons to really build up and show people what you can do. Cash flow-wise, profit and loss-wise, you need to accept that it’s going to be a multiple-year period before you’re going to be able to break even. I do think with some of those macro-tailwinds, the enterprise value can grow. SA: And the USL is on the upswing? PETER TREVISANI: I think the league has shown that licenses for teams have gone from I believe a few hundred thousand to $7 million in the last five years and will probably go up again, before they stop expansion. So, I do believe there is an enterprise value that will go up after time as the teams establish themselves. All that being said, personally, my time horizon is 100 years. I talk about what this team is going to look like 100 years from now, long after I’m gone. We’re working on something that in the year 2118 – they’re having the 100th anniversary for New Mexico United. And they can look back on we built and take it from there. SA: What are the revenue streams? PETER TREVISANI: Because we don’t have TV broadcasting as a revenue stream right now, although we’ve got all these games on ESPN Plus and it's certainly something that will grow over time, your No. 1 revenue stream will be ticket sales. No. 2 revenue generator will be sponsorships, corporate sponsorships. No. 3 would be merchandise, typically. No. 4 is that other -- there are some things you can do that can leverage the brand and the product. Really what you’re looking at is 80%-plus is going to come in from ticket sales and corporate sponsorships. PETER TREVISANI: We had to make a decision when we were talking about this team and I had to make a personal decision, too, in terms of go or no go. We don’t have our own stadium that we can play in. So, we’re not going to have stadium economics, which long-term would part of one of those four revenue streams. We could have either tried and get a stadium built and then bring a team. But what we decided to do is, let’s go show people what we’re about, what we believe, and let’s bring a team here. So we’re using Isotopes Park. A phenomenal stadium. Yes, it’s a baseball park, but it’s beautiful. It’s probably one of the best if not the best minor league park in America. Can seat up to 15,000. And so we felt like it was best to start there, build interest in the team, and then go for a stadium solution. We could do something privately, using the Phoenix pop-up model as an example. Or we could try for something that involved more of a private-public partnership in downtown Albuquerque. We’re going to be working on that, but the first thing we wanted to do is get the team on the field. SA: What can New Mexico United fans expect from your players? PETER TREVISANI: We’re trying to have players who do more than just come here for a year and play. Do you want to live here? Do you want to be active in community? Do you want to coach? Let’s look at ways how we can look after your long-term path while we stay focused on our short-term goals. Our players are not just going to be great players. They’re going to be connected to the community. They’re going to feel their supporters, not just see and hear them. And we're not a minor league team. Our players play for us. If they score three goals, they don't get called up to someone else's team. I think we're going to see the youth build relationships with the players. One big surprise for New Mexico, and anyone tuning into the USL, will be the quality of play. The level of play is very high. It’s not a semipro, it’s not minor league. A lot of USL players could play in MLS or other leagues, but choose the USL. 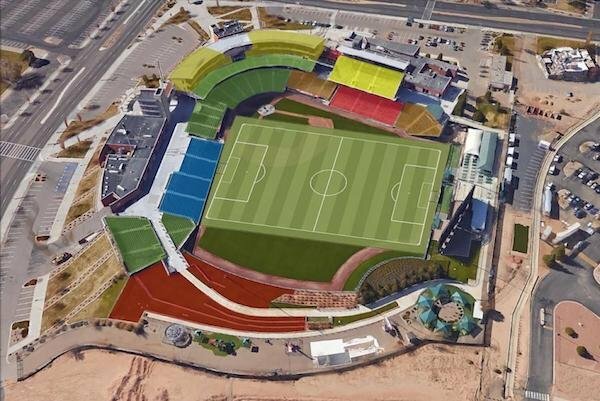 3 comments about "New USL owner Peter Trevisani on how the amazing power of soccer will enchant New Mexico". Wooden Ships, October 20, 2018 at 8 p.m. This is excellent news. Mr. Trevisani seems to be the right guy with the right vision. We had ambitious goals in the mid 80’s, with the Albuquerque Gunners (SISL), it didn’t pan out. Good luck New Mexico. Randy Vogt, October 21, 2018 at 7:44 a.m.
Peter Trevisani and Mike Woitalla touch on an excellent point. What are considered the most popular spectator sports in the United States––football, baseball, basketball and hockey––take hours to play while a soccer game takes less than two hours to complete. People are becoming busier and busier and more will look to soccer as an option because of this. I also believe that there are many more soccer fans than hockey fans in the US and soccer is slowly gaining on the three other sports I mentioned. frank schoon replied, October 22, 2018 at 10:01 a.m. It reminds me in the early daysof soccer ,lets say, about 50 years ago to hear comments from Americans in those days saying " soccer will grow because it is cheaper to play then other sports".